Strange and far-reaching are the places fandom can take you: in this case, Marvel's Secret Wars: Battleworld #4. As an avid enthusiast of James Stokoe's work, I've been looking forward to the release of this comic since I learnt he'd be doing a 10-page Silver Surfer story for it (and also a variant cover). You may recall Stokoe last year produced the most memorable of Marvel's 100th anniversary special issues with a future-set Avengers story. His contribution here is even more contracted, sharing space with another, separate Silver Surfer story by Peter David and Daniel Valadez. It can be precarious when singular talent goes to work for Marvel or DC, with results often being extremely diluted to the point of waste. Regardless of what you think of corporate comics, Stokoe is an excellent fit for them, due largely to his approach and understanding of properties. He is able to strike a balance wherein he create comics infused with his own particular sensibilities and interpretations whilst retaining the essence of what makes characters and world special. 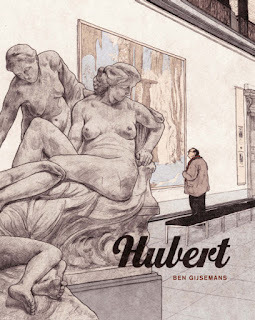 His art demands and hogs the attention, which can mean his capabilities as a writer often go overlooked, but he is without doubt the complete package where superlative comics-making is concerned. The premise of Battleworld, to those of us uninitiated, is explained on the opening title/credits page via some very excited sentences declaring: 'The multiverse was destroyed! The heroes of Earth-616 and Earth-1610 were powerless to save it! Now all that remains is...Battleworld! A massive patchwork planet composed of fragments of worlds that no longer exist...Each region is a domain unto itself! Within these domains exist multiple versions of the heroes and villains you know, each familiar yet completely different!' This means little to me, as someone who reads very few serialised comics, other than imparting that these stories essentially function as stand-alones and are relatively easily accessible. Sort of Else-worldy, and the opportunity to have some fun. It's easy to get lost in the sunning intricacy of Stokoe's art, and forget just how good a writer he can be; his comics are anchored by an emotional crux which allows them to function successfully as engaging, involving narratives. Stokoe begins the comic using what is probably the closest to a traditionally hued colour palette he's ever employed, and it looks beautiful: at once clear, sharp, and bright. The green and pink of Fin Fang Foom against a light yellow-white backdrop, especially, make for a visually satisfying pop. That opening section with the Surfer and Juggernaut taking down Fin Fang Foom is joyous, cool, and comedic; it is a warm, unlikely partnership of elegant finesse and blunt force. There's a great panel where Juggernaut's club meets the croc's snout, the former giving it all the welly he can muster, suspending him in the air at a right angle from sheer force: arms down, legs up, looking for all the world like a giant, round baby. As it progresses, the story turns to other, more horrific cadences, and saturation increases, those neon gradients begin to seep in, reflecting the shifting tone and atmosphere. Pleasure is to be had in all the little details that help to build the story, to make the reader invested, to look and care: for example, Fin Fang Foom, the Surfer, and Juggernaut are given additional costume and design characteristics. The croc has spiky jewelled arm bracelets, a wooden, beaded and feathered necklace, and a pink and purple chequered cloth and leaf woven head-dress. Perhaps not big things, but these work to imbue personality, elevating Fin Fang Foom's import beyond being just an exceptionally large crocodile. For his part, Surfer's cloaked robes appear to be made from a light hessian type material that covers his head, and he, too, is wearing gem-encrusted cuffs at his wrists, upper arms, and ankles, lending him a slightly different yet magisterial, almost royal look. Remember, the Surfer doesn't feel the elements, so these adornments are ones he's selected to wear for how they make him look and feel; another small facet that's more suggestive of Norrin Radd's mentality. Juggernaut, befittingly, remains in his Juggernaut costume with one change: he has a modified leather warrior skirt, and a resplendent, golden lionskin head worn over his helmet. 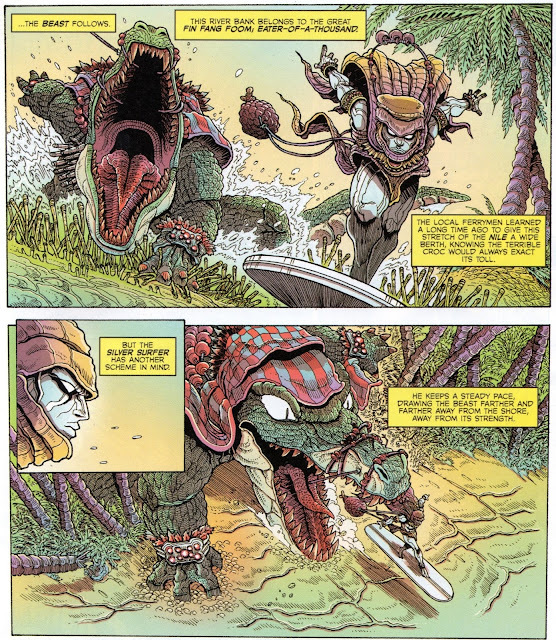 Stokoe's textures ground his work, giving it weight and depth, whether it's reptilian hide, palm tree trunks, muscle definition, or rocks on the ground. As fun and exuberant as it is, there's meat to it. What I like best about this story, however, is how well it complements Stokoe's previous Silver Surfer short comic, a story produced for Strange Tales (another alternate possibilities canvas); with both comics reinforcing the notion of the Surfer's fate being inextricably bound to Galactus; everything coming back to the point of his choice and sacrifice. In the Strange Tales short, the Surfer is invited to play a final game of cards with a group of beings who defiantly continue to drink and be merry as their world literally crumbles around them. 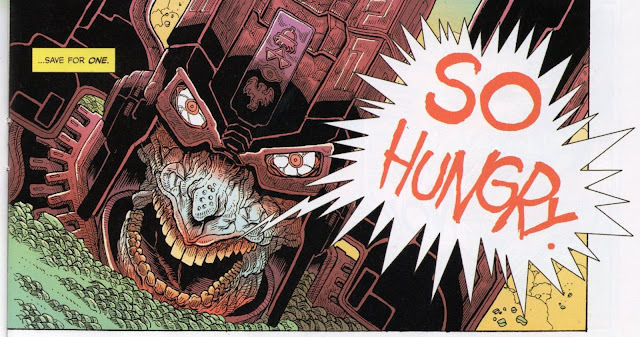 The Surfer has performed his duty, Galactus is feeding, and soon they will all be dead. But this is their home: they have no way -or intention- of leaving, and so they face death together, unbowed, in the place they love. 'May you never find a place to call home,' says one of the aliens to the Surfer as the last rocks fall. The poignancy of this is particularly heavy, because the Surfer, of course, has a home; a home to which he can never return. A home and people that live and thrive, that he loved so much he sacrificed himself to an unending life of terrible servitude in order for them to continue to exist. In this Battleworld iteration, the Surfer gets the better of Galactus and is set free, yet loses everything he cared and gave for. A third, unexplored option would be to simply do nothing when Galactus comes to feed: to die together with his home and people, and still, still he would lose. We like to think that given the opportunity to 'do-over,' we would make different choices, better choices, but how accurate is that? Ultimately, fundamentally, you would still be you. Would things really turn out differently or would a new set of problems present themselves? Or would you end up at the same destination via a previously untravelled road? It is not in the Surfer's nature to stand by and do nothing; he is who he is and that remains unchanged, therefore he makes the same choice over and over. This is what some people call fate. And that, in the end, is the Surfer's tragedy: regardless of the path he selects, despite the choice he makes, he always loses. He can never truly be free. Dig how Surfer's Battleworld attire suggests his hooded guise at the beginning of Moebius' Parable, too. A tidy visual allusion. I just want to say first, I really enjoy your blog! Also I am a big fan of Stokoe so anything regarding him or his work is a must-read. That interview you had with him recently was nothing short of extraordinary. I can't say anything bad about the man, other than I wish he was a robot that did not need to eat or sleep and could just put out phenomenal work non-stop (still waiting for that new Orc Stain too)! Anyway, keep up the good work, sir, and thank you for it as well! Thanks for the kind words; I love Stokoe'ss work utterly, too. Well I feel dumb. I have been brainwashed to think that way, I believe, even though I know there are plenty of female comic readers out there. Either way apologies for the assumption!